Location: Eastern Onondaga County, 2.5 miles northeast of the Town of Pompey on Pratt's Falls Road. Pratt’s Falls County Park is part of the Onondaga County park system and covers a little over 300 acres of land on the West Branch Limestone Creek watershed. The park has an archery course, ball fields, and picnic areas. It is open April to October from 8:30 a.m. to 5:30 p.m.. An admission fee of $1.00 per car is charged. There are over 5 miles of trails in the park. Park in the northwest corner of the main parking lot near the restrooms, and follow the Falls Trail (blue) northwards as it descends several flights of stairs into the gorge. When you come to a T intersection, follow the trail to the left (west), and it will soon curve to the south. The trail ends at a viewing area near the base of Pratt’s Falls. It is an extremely steep waterfall with a total height of 137 feet. The falls faces to the northwest and has a crest that is 8 feet wide. It is developed in the Skaneateles Formation which consists of a medium to dark gray shale with beds of mud-rock and limestone. The formation dates from the Middle Devonian Period and gives the rock an age of roughly 394,000,000 years. To view the falls from near the crest, return to the top of the gorge and follow the trail westwards. A viewing area is located on the eastern side of the falls, just before the trail crosses the creek. It was near this area that Manoah Pratt Sr. and Abraham Smith built a sawmill in 1796, the first in the county. 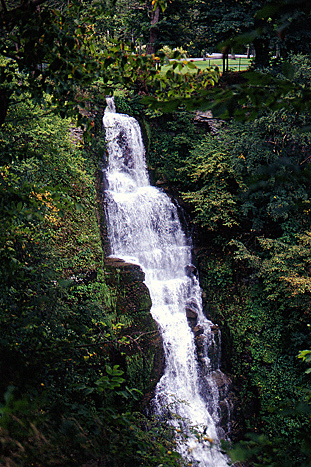 At least seven unnamed waterfalls are also found in the park. To view the highest one, follow the North Rim Trail (yellow) westwards along the top of the gorge. Roughly 1,000 feet west of the park office the trail will cross the West Branch Limestone Creek and turn northwards. A short distance after crossing the creek turn around and look to the south for a view of an unnamed waterfall that is roughly 30 feet high. The map below is a colour verison of the park map found on the Pratt's Falls Park web site.